Limited time only! 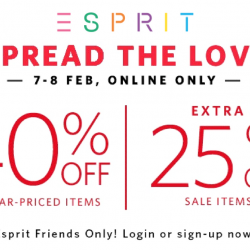 Esprit: CNY Online Sale with 30% OFF Storewide! 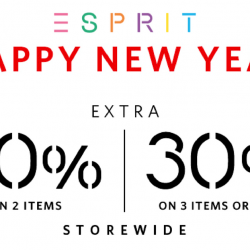 It's the CNY weekend and Esprit is having a 30% off storewide sale at their online store! Shop for women, men and even kidswear at 30% off now! For a limited time only. If you are not a Esprit Friend, just join for free when you check out! 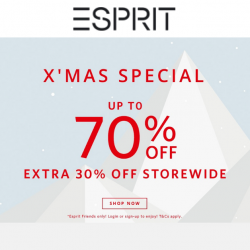 Get a new outfit for your year end party at Esprit's X'mas Special Sale! Get up to 70% off + extra 30% off storewide online! If you are not a Esprit Friends member, just sign up for an account before you check out! Till 21 Nov 2018 Esprit: Enjoy 30% OFF Storewide In Stores & Online! 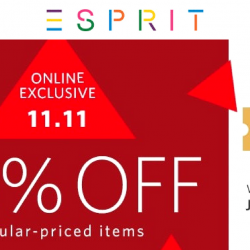 Missed Esprit's Double 11 deal? 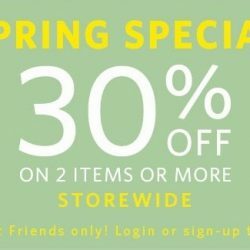 Sign up as an ESPRIT FRIEND now and enjoy 30% off storewide in stores and online! Sale ends on 21 Nov 2018. 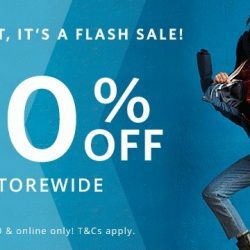 9 - 10 Oct 2018 Esprit: Online Flash Sale with 40% OFF Storewide! The best way to look good? – To feel good! Explore Esprit's new Collection and discover your favorite Fall Looks 2018! Grab new outfits at their Online Flash Sale with 40% off sitewide! Sale ends 10 Oct 2018. 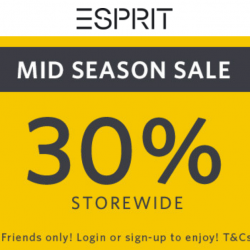 Till 10 Oct 2018 Esprit: Mid-Season Sale with 30% OFF Storewide In Stores & Online! It's that time of year again! —Esprit's Mid-Season Sale kicks off with an amazing 30% off storewide starting NOW, in stores and online! For Esprit Friends only, just sign up for free when you check out! Till 19 Sep 2018 Esprit: VIP Sale with 20% OFF on 2 Items & 30% OFF on 3 or More Items In Stores & Online! It's time to refresh your wardrobe with Esprit's versatile basic pieces. They've got you covered! Shop now at their VIP sale with up to 30% off regular priced items in stores and online! If you are not a Esprit Friend, just sign up for free during checkout online! Summer is almost over! For us Singaporeans, it means the hottest months of the year are nearly over. 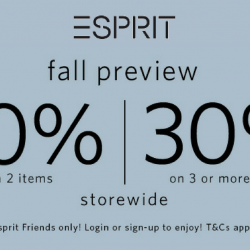 Celebrate by getting new outfits at Esprit's Fall Preview Sale! 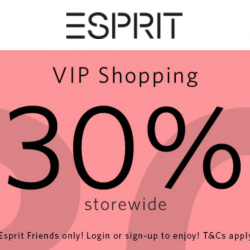 Esprit Friends enjoy 20% off on 2 items and 30% off on 3 or more items from now till 29 August 2018. Also get a free cosmetic bag upon any purchase, while stocks last. If you are not an Esprit Friend, just sign up for an account online during checkout! 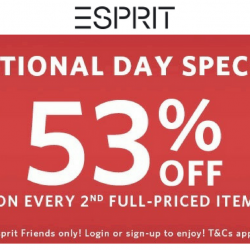 Celebrate National Day with 53% off on every 2nd full-priced item at Esprit! Get wearable and comfy pieces now! Sale ends 15 August 2018. For Esprit Friends only if you are not one, just sign up online for free! 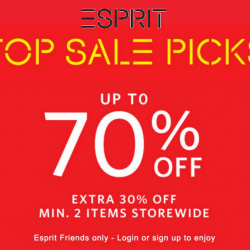 Shop at Esprit's Final Sale with up to 70% off plus additional 30% off when you buy 2 items and more storewide! For Esprit Friends only, if you are not one, just sign up for free online! Once you have any items in your basket, you can become an Esprit Friend. Simply choose 'Join Esprit Friends', enter your details and complete your checkout. Your new Esprit Friends digital card will be sent to you via edm or sms during the order process. Limited time only! 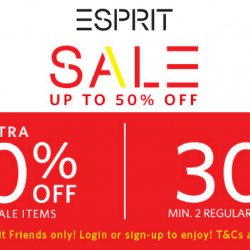 Esprit: Sale Up to 50% OFF with Extra 40% OFF Min. 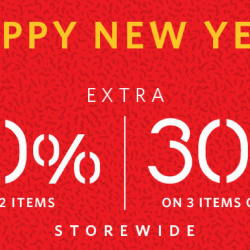 2 Sale Items & 30% OFF Min. 2 Regular-Priced Items! Get new summer outfits from Esprit! Their Great Singapore Sale is going on for up to 50% off with extra 40% off min. 2 sale items and 30% off min. 2 regular-priced items! Just sign-up as an ESPRIT FRIEND today free of charge! Till 13 May 2018 Esprit: Mother’s Day Flash Sale! 40% OFF Storewide + Free Esprit Cosmetic Bag with Any Purchase of S$150! Gift your mum with new outfits for Mother's Day! 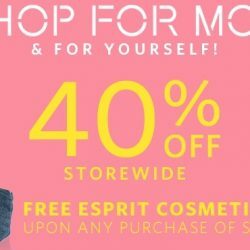 Esprit is having a Mother's Day Flash Sale with 40% off storewide online! Also get a free Esprit Cosmetic Bag with purchase above $150. Offer ends 13 May 2018, so shop now! 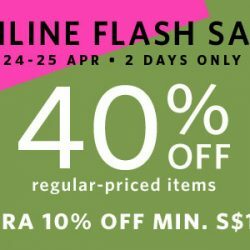 Till 25 Apr 2018, 2359hrs Esprit: Online Flash Sale with 40% OFF Regular-Priced Items + Extra 10% OFF with Min. Spend of $100! Cheers to colors! Time to swap your grays for bright everything with Esprit's new spring collection - you can enjoy 40% off regular-priced items and an additional 10% off when you spend $100 and above in this online flash sale! Sale ends 25 Apr 2018, 2359hrs, so shop now! Cheers to colors! Time to swap your grays for bright everything with Esprit's new spring collection - you can enjoy up to 50% off sale items; extra 20% off on 2 items or extra 30% off on 3 items or more storewide! Sign-up as an ESPRIT FRIEND today to seize the chance! 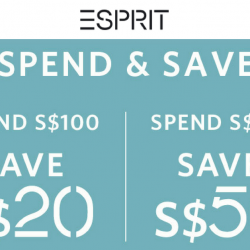 Till 14 Mar 2018 Esprit: Save Up to $50 when You Shop Online and In Stores! Upgrade your wardrobe with new colourful pieces from Esprit! Save up to $50 when you shop online and in stores from now till 14 March. 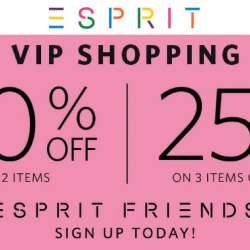 All you need to do is to sign up for Esprit Friends free of charge online when you check out! 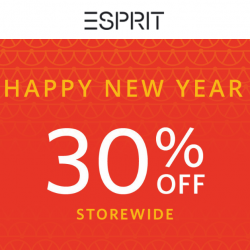 Esprit knows that Chinese New Year is important to you, that's why they are offering an exclusive discount - extra 20% off on 2 items; 30% off on 3 items or more - to help you feel good to look good in this festival! Shop now till 28 Feb 2018! If you are not an Esprit Friend yet, just sign up free online when you check out. 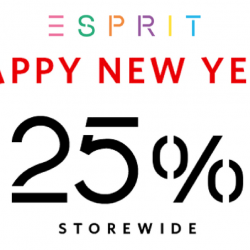 Early happy Chinese New Year to ESPRIT FRIENDS - come and enjoy the 25% off upon sign-up or login - the CNY collection are ready for you too! If you are not an Esprit Friend yet, just sign up free online when you check out! Chinese New Year is coming soon in less than a month - are you excited?! To celebrate the joyful moment, Esprit has prepared you an early bird discount - Extra 20% off on any 2 items; extra 30% off on 3 items or more! Pick your favorite styles today! If you are not an Esprit Friend yet, just sign up free online when you check out! 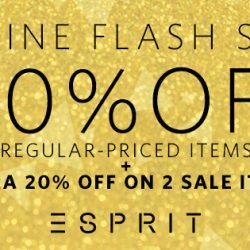 12 - 13 Dec 2017 Esprit: 12.12 Special Online Flash Sale with 40% OFF Regular-Priced Items + Extra 20% OFF on Sale Items! Double 11 and Black Friday are gone but if you haven't done enough shopping, 12.12 Double 12 is coming right up! BargainQueen continues to report the best deals so that you will not miss out any! First up is Esprit! This brand with its quality casual and work wear, is having an Online Flash Sale with 40% OFF regular-priced items and extra 20% off on 2 sale items! On top of these discounts, you get to enjoy free local shipping with our exclusive code. 12 to 13 December 2017, mark these dates now! IT’S 11.11 MEGA SALE TIME! 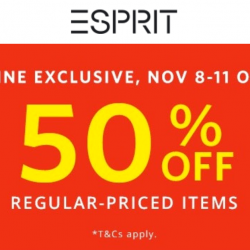 Online only and the biggest offer ever - 50% off on all regular-priced items at Esprit! What’s more? Spend just S$100 to enjoy extra 10% off and free gift! Don’t wait! Sale ends 11 November 2017. Cooler weather season is here! Whether you are going overseas or staying in Singapore, grab new fashion pieces at Esprit Winter Preview Sale with 25% off storewide in stores and online! 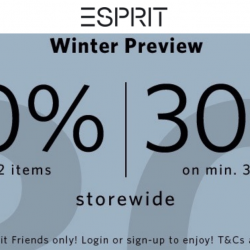 Exclusively for Esprit Friends, if you are not one, just sign up for an account online before checkout! Sale is on from now till 22 November 2017. Limited time only! 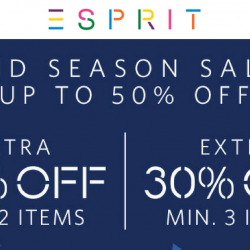 Esprit: Mid Season Sale with Up to 50% OFF In Stores & Online! Cooler weather season is here! Whether you are going overseas or staying in Singapore, grab new fashion pieces at Esprit Mid Season Sale with up to 50% off in stores and online! 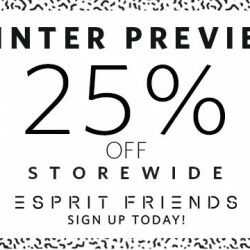 Exclusively for Esprit Friends, if you are not one, just sign up for an account online before checkout! Sale is on for a limited time only. Waiting for a good reason to become Esprit's VIP? 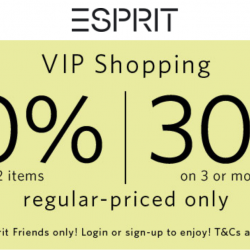 Sign-up as ESPRIT FRIENDS before the check-out, so you'll enjoy VIP shopping offers right away! Enjoy 20% off on 2 items or 25% off on 3 items or more from now till 10 September 2017!